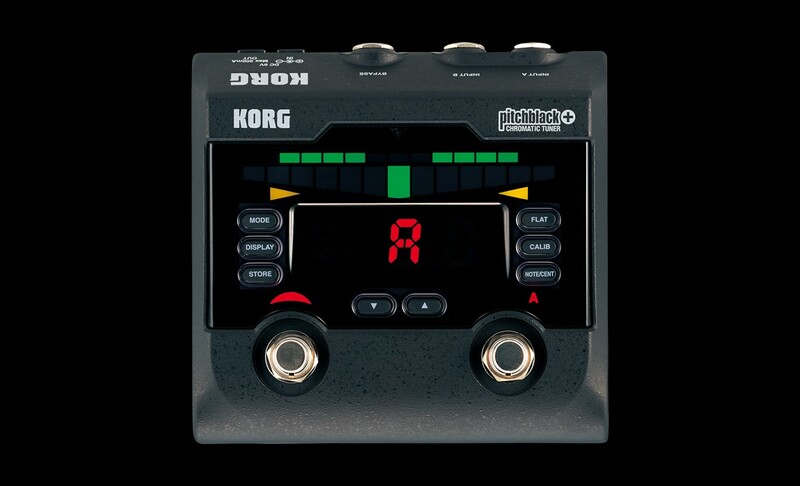 Korg pitchblack+ – The Chromatic Pedal Tuner with Unmatched Precision and Accuracy! In addition to ultra-high precision tuning with an accuracy of +/-0.1 cents, and True Bypass you can also connect two guitars or basses to this pedal tuner, tune them differently, and even store your own custom tunings. 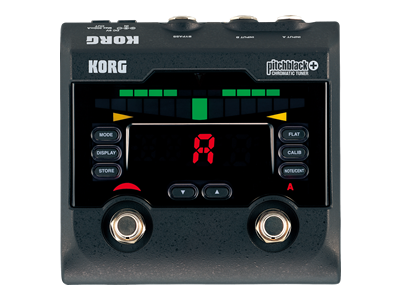 The Korg pitchblack+ is truly a professional chromatic pedal tuner that’s indispensable for both recording and live use. Professional guitar and bass pedal tuner offers ultra- precise tuning with an accuracy of +/-0.1 cents. Tuning is easily seen by a newly developed “dual meter” using large extra bright LEDs. Calibration is adjustable from 436-445 Hz. The Pitchblack+ is a high-end pro-quality pedal tuner boasting ultra-high tuning accuracy within a range of +/-0.1 cents. Housed in a sleek black aluminum die cast body it packs a versatile range of tuning modes such as chromatic, standard (guitar/bass), open D, open E, open G, open A, and DADGAD, and also lets you create up to five custom tuning programs of your own with any temperament you specify. This is ideal for accommodating special tunings such as ethnic instruments and stretched tuning. The Pitchblack+ also supports tuning for seven-string guitars and six-string basses. In addition, you can also use the flat tuning mode to tune your instrument as many as seven semitones below standard pitch. With a broad tuning range of E0 (20.60 Hz) to C8 (4186 Hz) and calibration that’s adjustable in a range of 436–445 Hz, you’ll be able to tune with an unprecedented degree of accuracy. The Pitchblack+ offers a new level of high-precision tuning demanded by professional guitar and bass players for the recording studio or in live performance. The Pitchblack+ features a large 13-segment LED meter. In conjunction with the tuning guides located below the meter that indicates whether your instrument is sharp or flat, the smooth-moving LED’s provide highly visible confirmation for accurate tuning at any viewing angle. The note name, tuning mode, and calibration are shown by large, highly-readable displays in green and red, and the tuner on/off status is shown by a red LED, ensuring that you’ll see everything you need even if you’re on a dimly-lit stage. You can choose between two types of display modes: Single mode or Double mode. In Single mode, you can choose between Meter mode, Full Strobe mode, Half Strobe mode, or Mirror mode. In Double mode, you can choose from two newly developed modes; “Focus mode 1” and “Focus mode 2” which offer even greater precision with excellent visibility. Dual input jacks allow two instruments to be connected. True Bypass ensures that the input signal is unaffected. As a professional pedal tuner, the Pitchblack+ provides A and B input jacks to which you can connect two different guitars or basses, and individually specify a separate calibration, tuning mode, flat tuning, and display mode for each guitar/bass (input). If only a single instrument is connected, you can specify two different tuning settings and switch between them by pressing the “INPUT SELECT” foot switch. This supports situations such as when you’re playing more than one guitar/bass in a live situation, or sophisticated musical needs such as using different tunings with a single guitar for multiple songs. The sound is muted when tuning is active, and when tuner is off the True Bypass feature ensures that the input signal from your instrument is not colored in any way whatsoever. With functionality such as this, the Pitchblack+ can provide high-precision tuning capability while being integrated into your guitar or bass pedalboard and amp setup. The Pitchblack+ works great with your current pedalboard system. 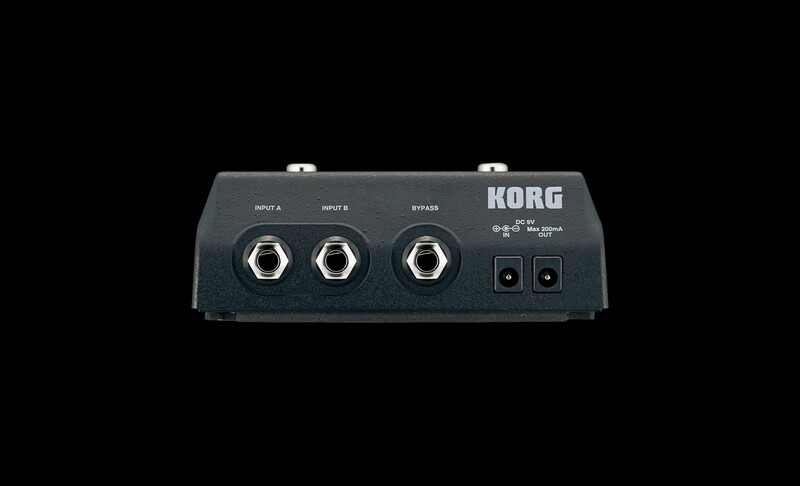 It provides a DC OUT jack that can supply power to other effect pedals when the optional AC adaptor is used. By connecting the included DC cable, you can supply up to 200 mA of power to multiple effect pedals that require a 9V supply, simplifying the power connections in your effect board.